Leafy green, butter yellow, raspberry red, carnation pink , marine blue. No, these are not the ingredients for a new age salad, but the colors currently being featured in the clothing collections for spring. It’s a good time of year to be stepping out of our staple black, gray, and tan neutrals, but many of us aren’t quite sure how to integrate these colors into our wardrobe. When you consider coupling these brights along with the season’s vivid patterns of stripes, plaids, florals and repeating graphics you may decide you want to stick with solid neutrals after all. The key to wearing the season’s brighter and more saturated tones is to pair them with a neutral. But in a combination that you wouldn’t expect. For example, carnation pink looks terrific with olive green; butter yellow works with stark white; leafy green complements khaki tan, and raspberry matches well with dove gray, another of the season’s versatile neutrals. Likewise, don’t be afraid to include some of the season’s bold patterns in your outfits. A repeating graphic or Ikat print is the perfect antidote to a bland business wardrobe. 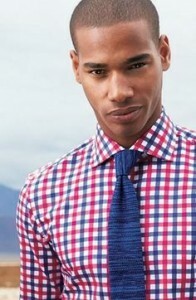 Try including a bold pattern in your blouse, necktie, scarf, jacket or dress. Textured fabrics work well in addition to, or in place of patterns. Jacquard, twill and boucle all add texture while remaining business appropriate. Adding color will brighten your mood along with your outfit. Studies have shown that wearing one bright color increases your energy level, and makes you more memorable to those you meet. Choose colors that complement your complexion, and keep the level of contrast in your outfit consistent with the contrast between your hair and your face. If you’re unsure which pattern is most flattering keep in mind that size matters. A smaller size pattern is best for those who are slimmer, more petite, or with a quiet personality. Those with more dramatic body types or personalities can wear a larger, more flamboyant pattern. The shape of the pattern (esp. for women) can mimic your body type: curvy ones like paisley or florals for curvier body types, stripes, plaids and other linear prints for straighter body types. Medium size patterns can flatter everyone, and in business I suggest designs that are no larger than two quarters. Mixing patterns can be done by considering size and color. A larger pattern can be mixed with a smaller one so long as the colors are consistent. For example, a plaid jacket, striped shirt and medallion tie will look fine together, so long as they share colors, and are of different sizes. Patterns will draw the eye’s attention, and create a focal point. Eyeglasses, handbags, jewelry and scarves can all have patterns, so feel free to mix and match keeping colors similar. Texture in fabrics is huge this season, and I’ve always liked the look of mixing the same color fabrics in different textures. Spring suede and leather, twill and jacquard (tone on tone, where a pattern is woven into the fabric) can pair well with smoother fabrics such as silk, chiffon and jersey. Instead of figuring out the tone on tone look yourself, many garments already come with different fabrics pieced together. Otherwise simply adding a textured fabric to your outfit can enliven and update it. Color and pattern placement is key, so be sure to use these details in spots on the body where you want to draw attention. They can also be used to draw attention away from problem areas. A colorful scarf, blouse, belt or patterned jacket will help you stand out and put attention where you want it. Similarly the reason why neckties work well for men is that they add a pop of color and personality at the face. Decide where you want to draw the eye’s attention, and go for it! Adding a simple repeating pattern or pop of color to your outfit can update many of your neutral looks without a large investment. It will make you energized and fresh and unforgettable!